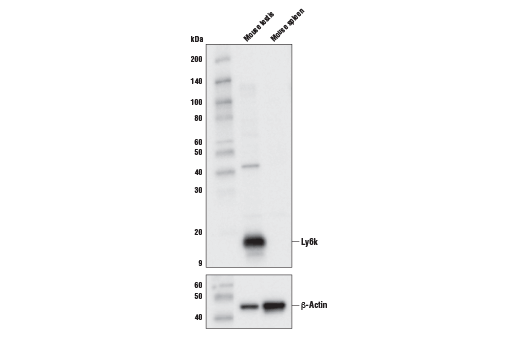 Western blot analysis of extracts from mouse testis and mouse spleen using Ly6k Antibody (Mouse Specific) (upper) and β-actin #8457 (lower). Mouse spleen is negative or low for Ly6k expression as expected. Ly6k Antibody (Mouse Specific) recognizes endogenous levels of total Ly6k protein. Polyclonal antibodies are produced by immunizing animals with a synthetic peptide corresponding to residues surrounding Pro70 of murine Ly6k protein. Antibodies are purified by protein A and peptide affinity chromatography. Ly6k is a member of the Ly6/urokinase type plasminogen activator receptor-like protein (uPAR)(LU) superfamily. It is expressed in testes where in interaction with another (uPAR)(LU) family member, TEX101, it is proposed to be necessary for the production of viable sperm (4). The human ortholog of this protein, LY6K, has been characterized to be a cancer testes antigen. It is found to be upregulated in numerous types of cancer, including esophageal squamous cell carcinoma, bladder cancer, and breast cancer (5,6). Endo, S. et al. (2016) Sci Rep 6, 23616. Ishikawa, N. et al. (2007) Cancer Res 67, 11601-11. Kono, K. et al. (2009) Cancer Sci 100, 1502-9.